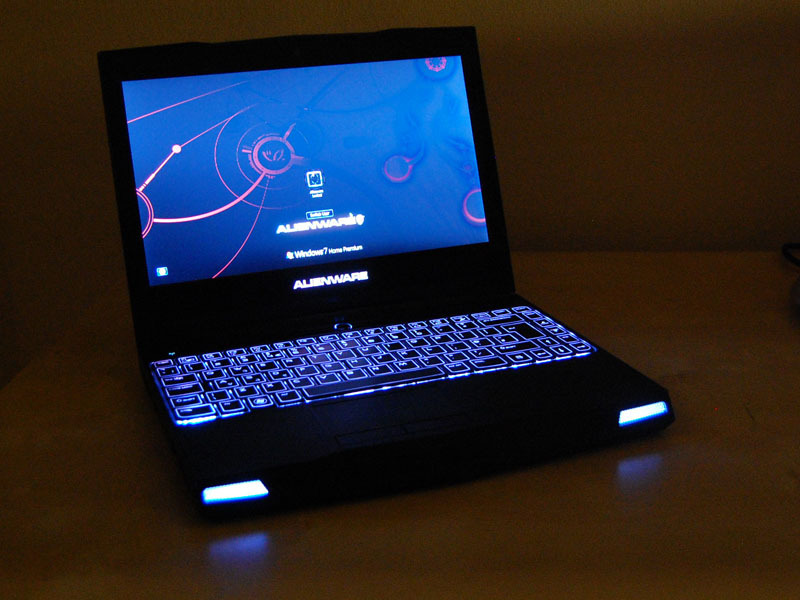 When it was introduced in early 2010, the Alienware M11x was pitched to performance computing enthusiasts as the fastest gaming laptop for its size on the market. The product has been updated twice since, with the 3rd revision (hence R3) based on the Intel ‘Sandy Bridge’ mobile processors. 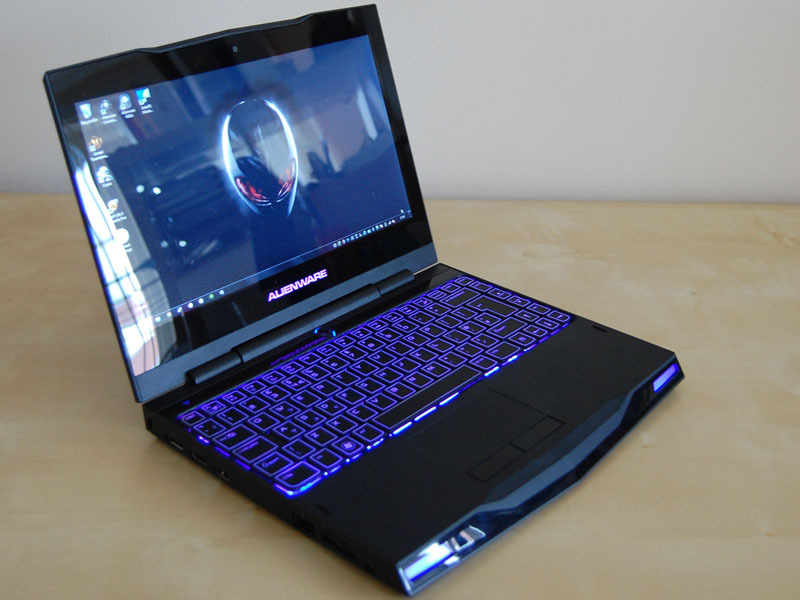 Performance computing is what we’re all about at Overclockers.com, so courtesy of Dell we have reviewed one of these units: is it really a portable yet competent gaming machine? While, of course, the Alienware doesn’t aim to compete directly with either of these units, if the M11x is what it sets out to be, then it should comprise the best features of the solid and fast workhorse (the Lenovo) and the portable netbook with longer battery life (the Packard Bell). The review unit, while a UK spec’ model, should be not too dissimilar from what you can get on the other side of the pond or elsewhere in the world. 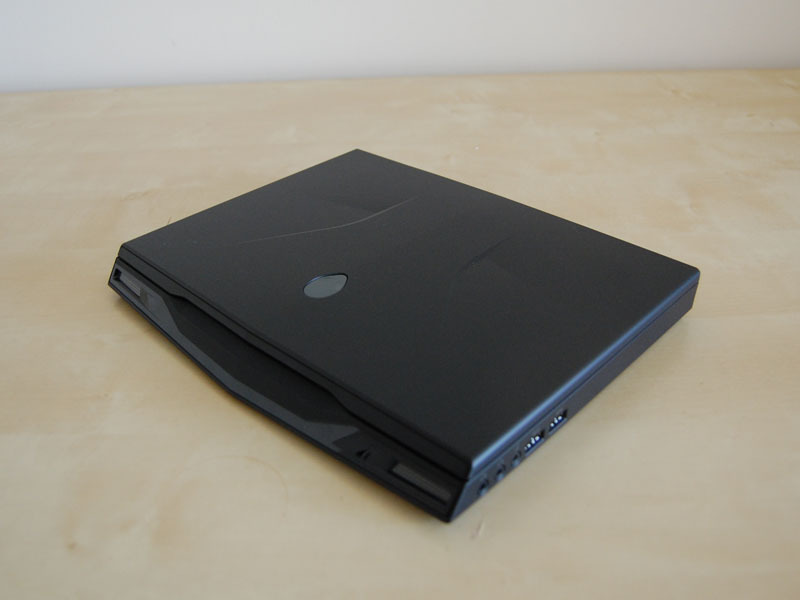 The machine arrived in an attractive, yet not too flashy, black box; inside the laptop was wrapped in a thin cloth case, which is a nice alternative to a plastic wrap, and held snugly in some black foam. 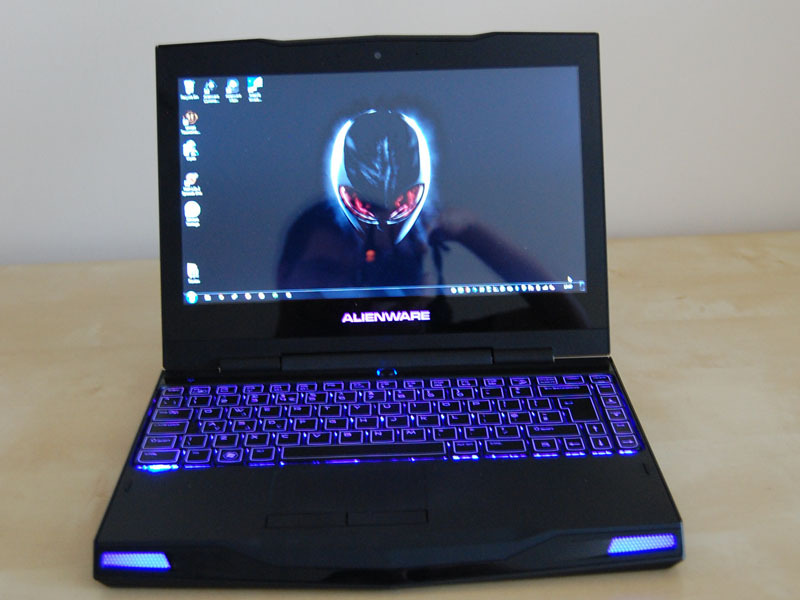 As well as the laptop, the package includes recovery disks, power adapter, an Alienware sticker and a user manual. I opened the package while some friends were visiting: while the styling seemed to quite impress the guys, the girls were far from convinced. My better half softened towards it once she realised the whole thing could light up in bright hot pink, however. The battery is non-removable, which is presumably a result of the engineers trying to cram everything in, but still makes me slightly uneasy (call me picky, if you will, as I like the flexibility of being able to change the battery myself). The power adapter was a square brick without the handy cable management ‘rubber band’ that comes with the Studio laptops, for example. It’s only a small touch, but I felt it was missing on such a high-end unit. 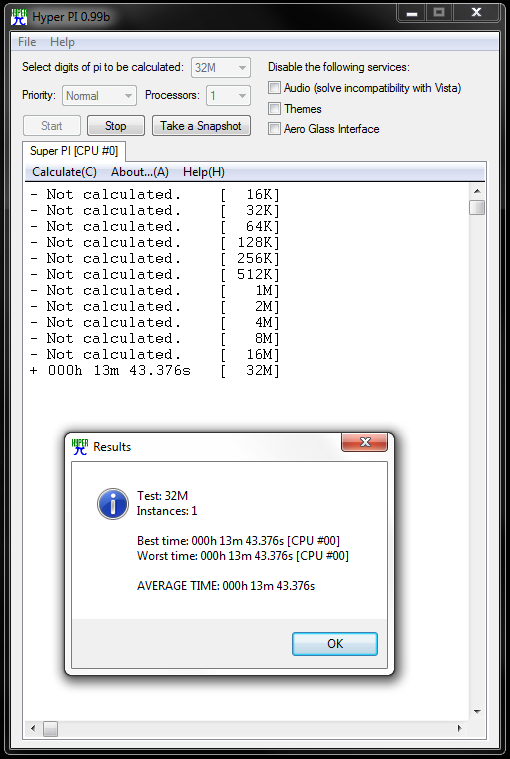 CPU: Intel Core i7-2617M CPU @ 1.5 GHz. 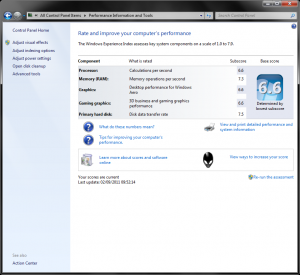 Dual core with hyperthreading and turbo boost up to 2.6 GHz. RAM: 4 GB of DDR3, 1333 MHz. Graphics: 2 GB NVIDIA GT 540 M plus Intel HD graphics. 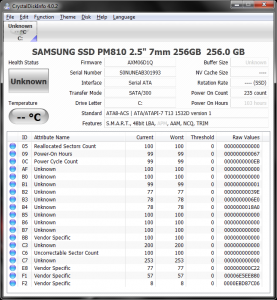 Hard Disk: 256 GB Samsung PM810 Solid State Drive. Connectivity: 3 x USB 3.0 ports, 1 x HDMI, 1 x DisplayPort, 1 x multi-format card reader. 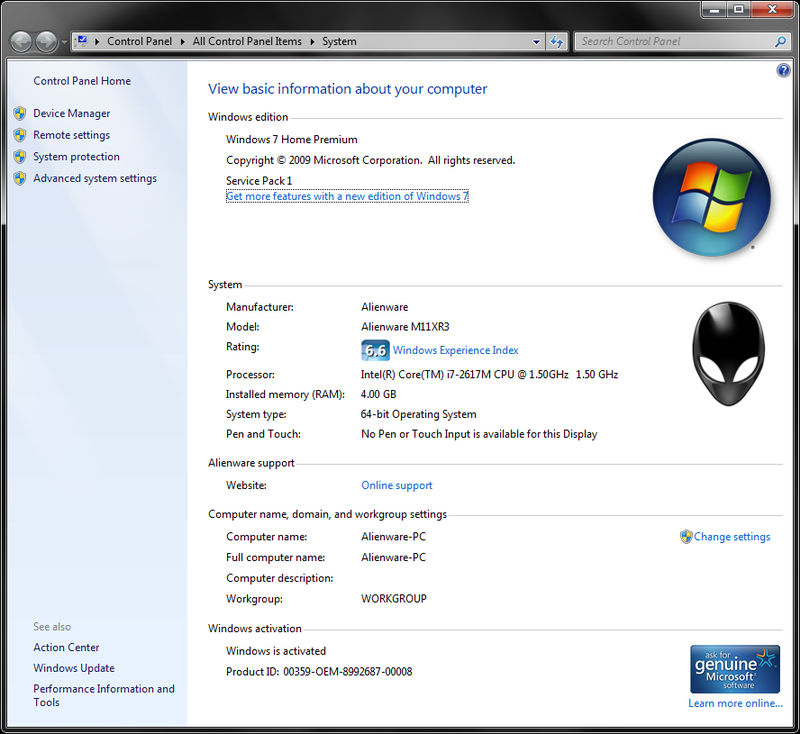 Although the unit came with Windows 7 Home Premium, I upgraded to Service Pack 1 before running the benchmarks. 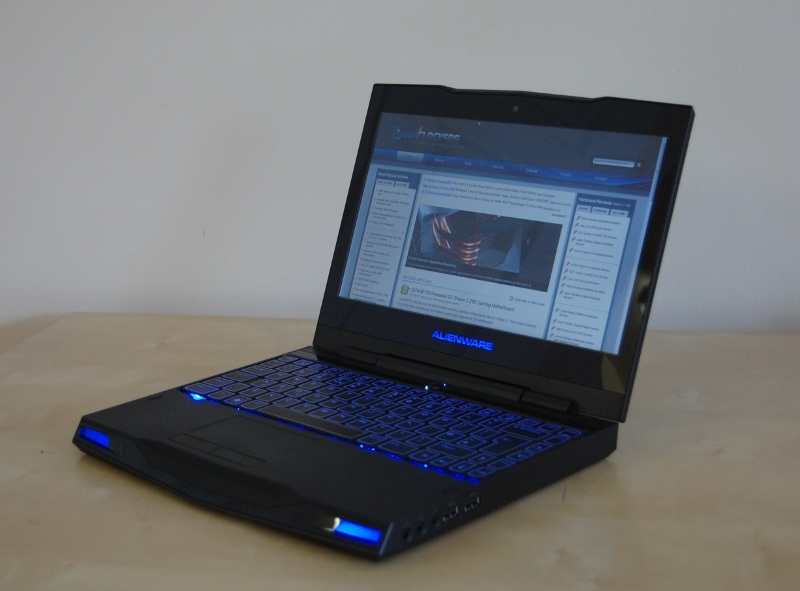 The unit came with a 1.5 GHz CPU, which idled at 0.8 GHz and could turbo-boost to 2.6 GHz if required. 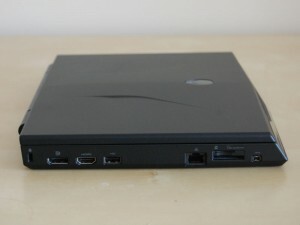 The M11x features a number of ports. Along the right hand side are two USB ports, two headphone jacks and a microphone jack. The USB ports felt rather stiff; with my USB mouse plugged in, pulling on the USB plug moved the (rather heavy) laptop and I needed to use two hands to remove the plug from the socket. 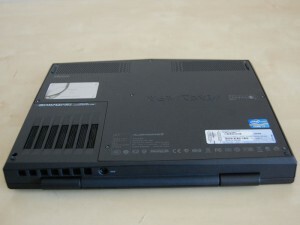 The back of the unit features only the power socket, the plug is rather solid and should survive repeated plugging and unplugging. Along the left can be found a DisplayPort socket, HDMI socket, USB port, ethernet port, multi-format card reader, and a small Firewire port. The cards only insert part-way into the card reader, as tested with my 4 GB SD card, but it’s clear when the card is in, and shouldn’t be easy to accidentally dislodge. The ethernet port seems to be in a slightly odd place, I’d have preferred it to be out of the way towards the back of the laptop, but then Alienware has crammed a ton of stuff into a very small unit. 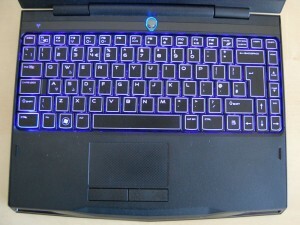 Notable exclusions include e-SATA and analogue RGB connections. 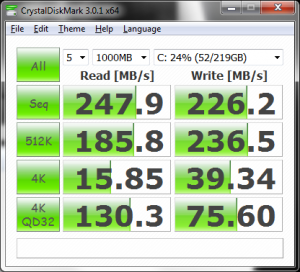 However, these shouldn’t be earth-shattering issues: USB 3.0 should be pretty quick (although, I don’t have a USB 3.0 device on hand) and, unless you have older visual kit kicking around, the lack of analogue connections is a welcome push forward into the newer A/V standards. 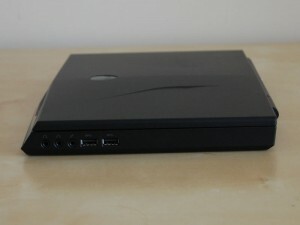 The unit also features a built in 2 megapixel camera, which can do photos or videos in resolutions up to 1600 x 1200. Helpfully, a small white light comes on when the webcam is active. Not so helpfully, the camera is absolutely useless in a dark room; even my lit-up phone was not detected beyond about 15 cm from the camera. The image quality in a lit room is perfectly adequate for video conversations and such. Maybe I ought to have shaved? With a DisplayPort and an HDMI output, it is possible to hook this up to an external monitor. Testing this with my HDTV (via HDMI) and my monitor (via DVI with a DVI-DisplayPort adapter) revealed that, not only can you elect to use one of the external outputs and/or the laptop screen itself, but that you can have all three outputs active at once. This would be very useful if you had a pair of monitors on your desk and still wished to use the laptop screen itself, and it’s nice to see that this option is available. I should note that the HDMI and DisplayPort are very close to each other and to the adjacent USB port – I only just managed to get the DisplayPort adapter and HDMI adapter in there at the same time. An extra centimetre spacing would have been ideal. 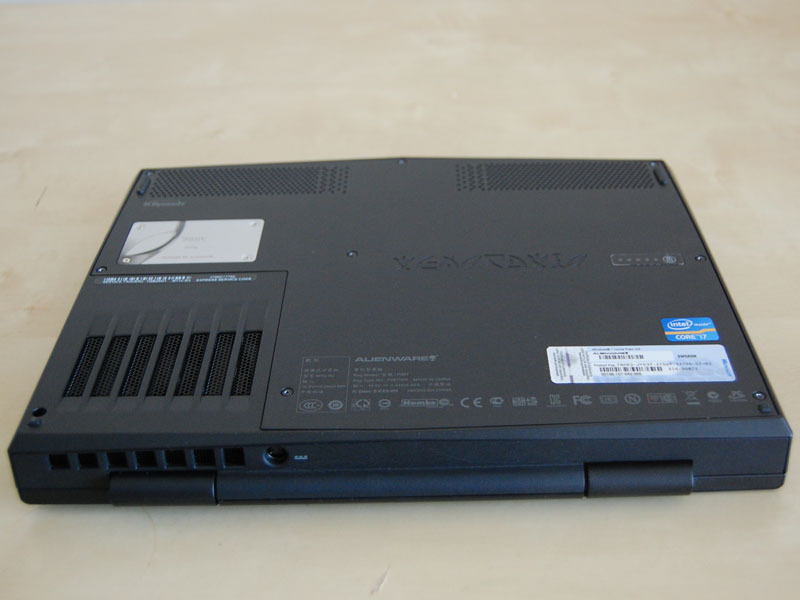 The unit feels quite solid and sturdy, and comes in at 2.015 kilograms (4.4 pounds) as measured with my kitchen scales, compared to 1.457 kilograms (3.2 pounds) for my netbook; official specifications for the W510 suggest that it starts at 2.6 kilograms (5.9 pounds). Although the M11x is a little weighty for its size, there’s a lot in there. The overall finish of the unit is excellent. The plastic feels high quality and there’s only the tiniest bit of flex in the body itself. The screen hinge resists enough to feel solid, but can (just) be opened with one hand. 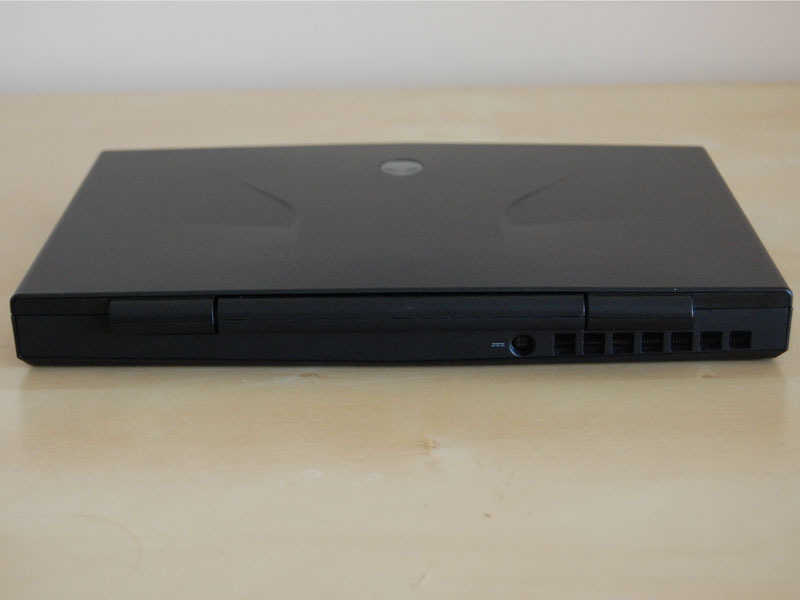 The hinge looks well-enough connected to avoid becoming a weak point in the chassis. 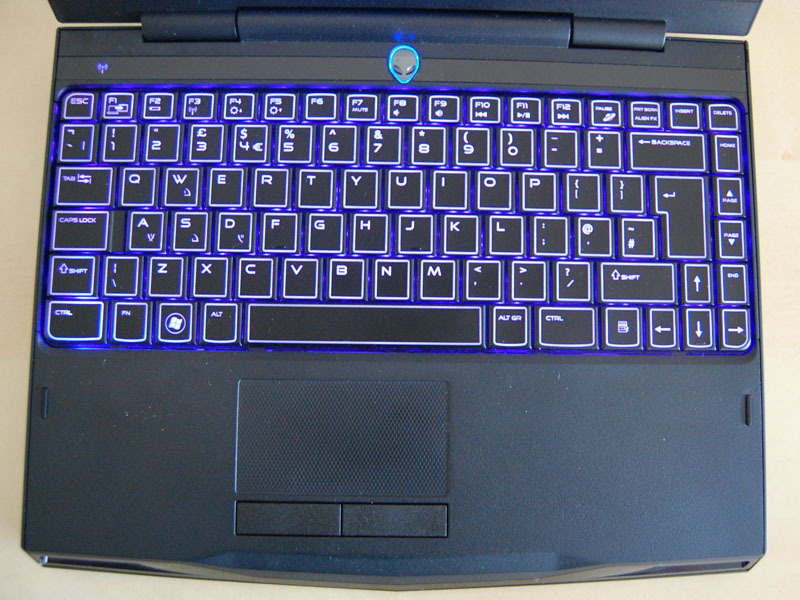 The keyboard is quite nice; it’s reduced in size compared to the Lenovo or Dell laptops, but it didn’t take me very long to get used to typing on it. In fact, most of this review has been typed on the unit itself. The keys have a slightly soft and rubbery texture which makes them quite pleasurable to type on, and the keys travel far enough to feel satisfying. 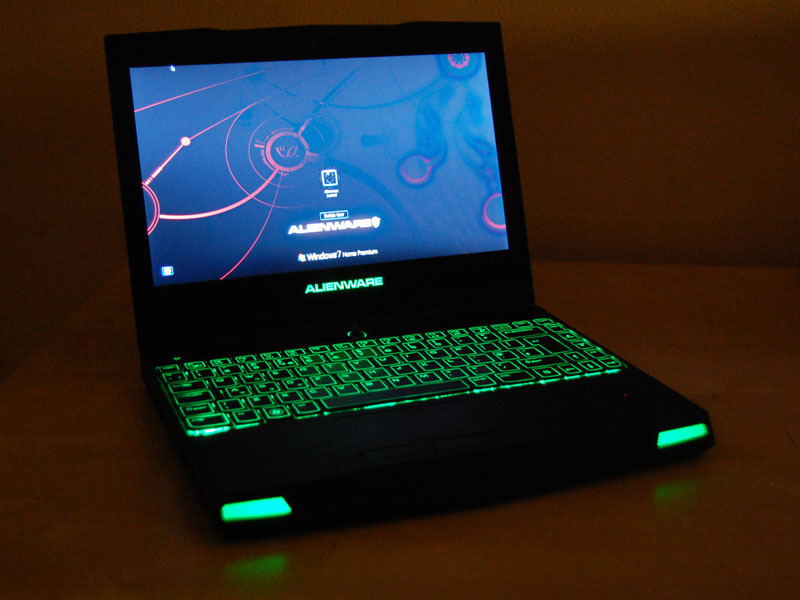 Function keys for the usual (and not so usual) gizmos can be found along the top: external display on/off, power settings, wireless kill switch, brightness up/down, mute, volume down/up, back a track, play/pause, forward a track, Alienware settings, and AlienFX on/off. The screen, however, is the weak point of the unit. When sitting in a dark room with the AlienFX on (see later) and the screen on the second lowest brightness setting, it’s fine. Colours and blacks are nice, and the screen is very easy to read. In a lighter room, it’s a different story; the sheer mirror finish of the LCD makes it awkward to view, even head on, when there is a source of light. I’m not a fan of glossy screens in the first place (my Lenovo features a matte screen), but this one is just awful, whereas that of the Dell Studio 15 is still quite usable. I’m no engineer, but I can’t help but stare at the inch thick bezel round the LCD and wonder if this could actually have been a 12.1 inch screen. I took a few shots at different angles, so that readers can see for themselves how the gloss essentially nukes any sort of viewing angle; horizontal viewing angles aren’t too bad for the panel itself, but vertical viewing angle is poor. The unit features a backlit logo (on the screen bezel), alien head power button, status indicators, keyboard and speakers; the colours of these are controlled by the Alien FX software. At first, I screamed gimmick, but it’s actually quite a nice feature. It does add to the look and feel of the unit, especially in a dark room, and it grew on me over the time I had the review sample. Various colours are available, from greens and blues through reds, oranges, yellows, pinks and purples. White and black are also available, with the latter simply turning off the backlight on that item. All this is generally quite positive: the unit feels very good, and apart from the screen it all seems like a very nice package. 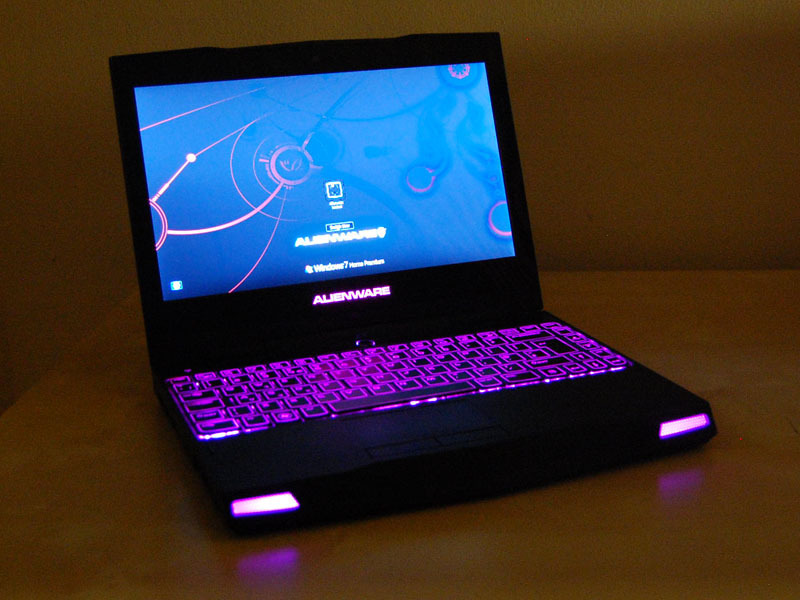 The M11x is pitched as both a gaming machine and as a small and portable laptop; it is therefore of interest to see exactly what sort of battery life one can expect from the unit. First, I conducted some rough tests, using the laptop as the imagined end-user would. 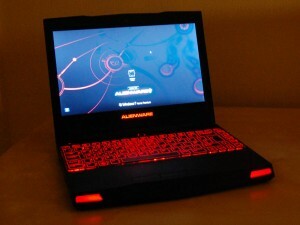 Using the laptop to browse the internet, and to write parts of this article, 25 minutes of use (in the high-performance setting, with the screen brightness right up and the AlienFX on) depleted the battery from a full charge to 93%, suggesting that I could use the laptop for a total of 6 hours on a full charge. A similar test with the balanced profile suggests about 7 hours should be feasible; turning the AlienFX off and changing the unit to power saver would achieve 10 hours of use on a full charge. The wireless LAN was on in all of these tests. At the other end of the usage spectrum, a full battery yields 1 hour and 45 minutes of Unreal Tournament 3 (and a couple of thousand frags…) on 90% of the battery, which I found rather impressive. While the battery life on the i7’s built-in graphics is pretty good, the 540 M pretty quickly drains the reserves. However, I don’t think many people would expect much different. Nearly two hours of killing on a charge isn’t to be sniffed at and should allow the travelling gamer to get a few half-hour stints in while on the move. Being able to do a days worth of web browsing on a single charge is also pretty good. The unit contains some quite high-end electronics, and tends to put out a bit of heat when it’s running full blast. On the battery, it’s quick to ramp the fan up to full blast, which makes quite a loud whooshing noise. It’s not as bad on the battery (with the passive cooling policy) and will gently turn on the fan rather than jump straight to hairdryer mode. With headphones on or with some noise from a game the louder whooshing noise isn’t too bad, although it might annoy those around you. The exhaust air is usually very warm, suggesting that the cooling solution is doing its job properly. 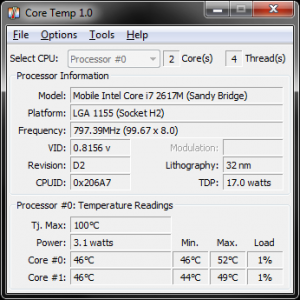 Core Temp tells me that the unit tends to sit around 45 °C while on the mains power at a desk. The maximum temperature reached during a couple of hours of gaming was 78 °C, which is a little high but not too bad. This was all measured in a room at a little below 20 °C. Those of you in more tropical climates may fare differently; I live in Scotland, after all. Audio is provided via a Realtek HD Audio chip, either from the built in Klipsch speakers or from one of the two headphone jacks. When plugging my headphones into either of the audio jacks without any applications producing sound and with the volume up full I couldn’t hear any noises while sat in a quiet room with the window closed. I had a previous (HP) laptop which produced annoying background squeaks and so on when the headphones were in. Playing some music on Spotify led to clear sound, even at full volume, although sound quality in this manner will be highly dependent on your headphones. Audio from the speakers is decent, not too tinny and good enough even to play music. Although, it doesn’t quite fill an (admittedly large) room as much as a ‘proper’ sound system it’s definitely an above-average speaker offering. Playing the top 20 or so tracks on Spotify failed to goad the speakers into making uncomfortable noises even at full volume; it also handled a few songs I selected quite happily. The bass, while not as strong as ‘proper’ (for want of a better term) speakers was enough to avoid making them sound tinny. Sound quality was more than adequate for gaming, although I tend to wear headphones personally. This is, as you would expect on a site such as Overclockers.com, going to be one of the larger sections of this review, although I was forbidden from overclocking or opening the laptop, unfortunately. 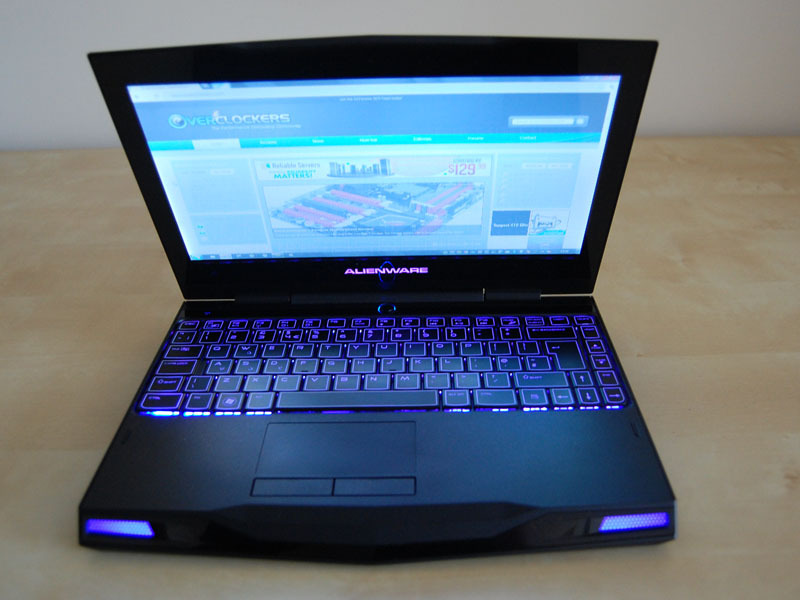 The laptop feels quite fast – I don’t find myself sitting waiting for things to happen. The boot time, as recorded by Soluto, is about 30 seconds, a quarter of the time it takes my Thinkpad. Applications load up quickly and the whole experience is very smooth. 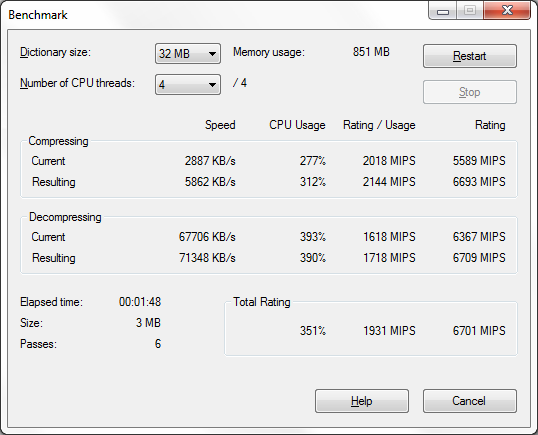 Synthetic benchmarks are a useful means of comparing systems; some numbers are provided below. Unfortunately, as the Lenovo lacks a DX11 card I can’t run the latest 3DMark on it, so have resorted to 3DMark Vantage instead. 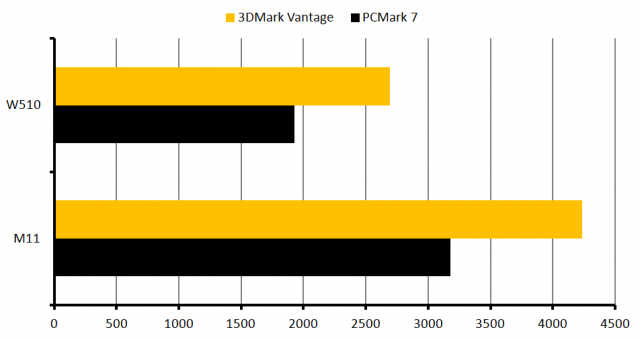 PCMark7 scores are also provided, and 3DMark2001SE just for a laugh. 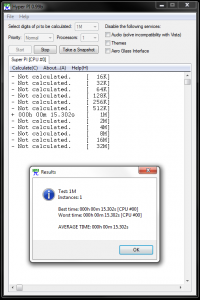 The newer benchmarks were run in triplicate, and 3DMark2011SE run once. 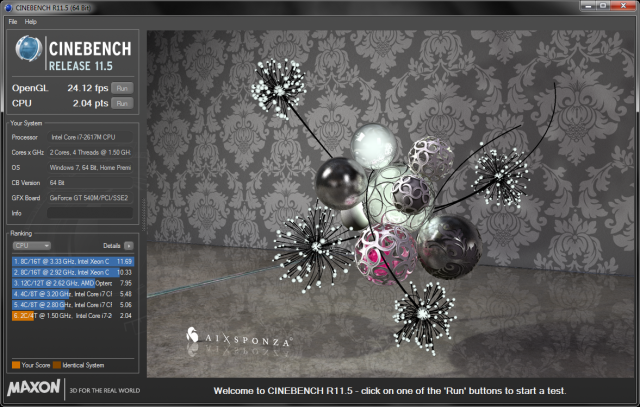 I also ran a variety of other benchmarks on the unit to try and gauge how well the system performs: Cinebench (11.5, x64 version), 7-zip (default benchmark settings, 5 passes) and SuperPI (single instance, 1 M, 8 M and 32 M). The CineBench score seems low in comparison benchmark systems, but then it has at most half of the cores that those systems possess. 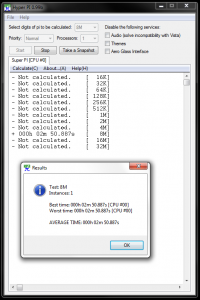 It’s not, however, particularly far off the performance of an AMD X6 1100T at 4 GHz, which manages to score 2.68 (see the X4 840 review by mdcomp). 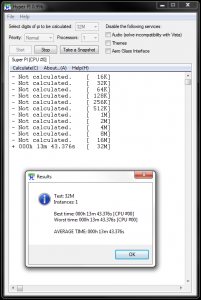 The SuperPI scores are below, they seem to pretty much wipe the floor with even high-end AMD desktop chips (although SuperPI has never been an AMD strong point), but sit a little behind the Intel chips. Even with the Turbo Boost, the mobile chip can’t quite rival its desktop brothers, but they are of course designed with different usage in mind. 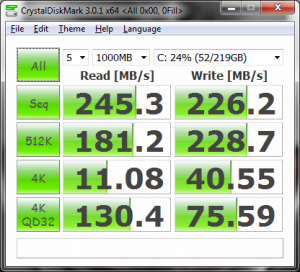 With a solid state drive in the unit – and having not owned a solid state drive myself – I was interested to find out about the storage performance. Two benchmarks – Atto and CrystalMark were employed, and revealed ca. 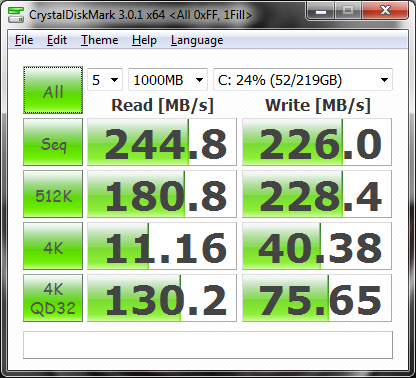 250 MB/s transfer rates. 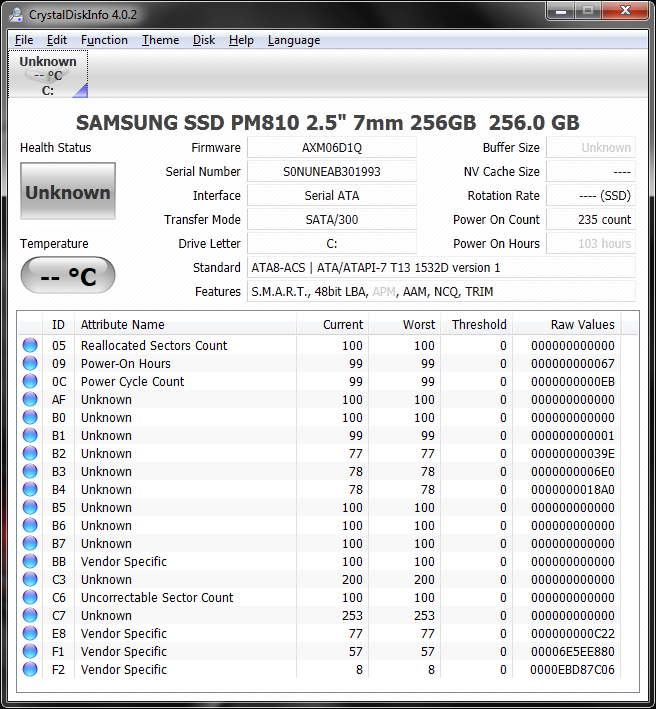 This is slower than drives such as the Vertex 3 that EarthDog recently reviewed by a wide margin, but then the Samsung is SATA 2 and not the newer SATA 3 standard. 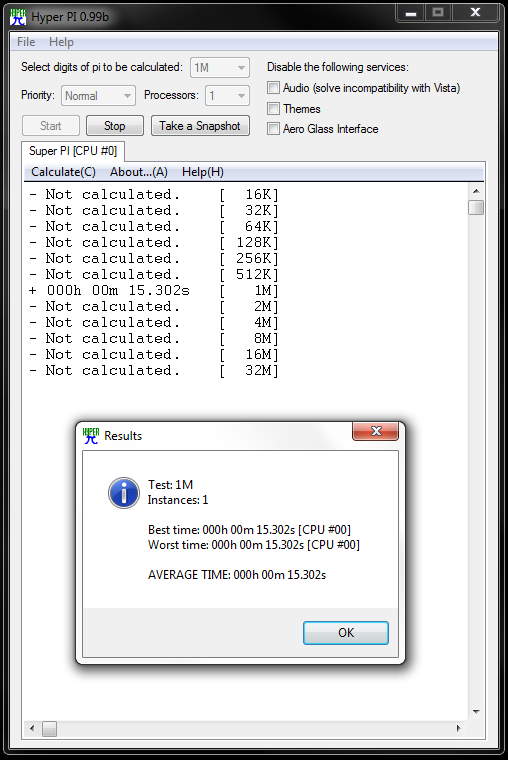 As well as the more objective, “here’s a number that means ‘fast'”-type benchmarks, a few more subjective tests were employed. The unit plays 720p and 1080p content smoothly without stuttering, tearing or artifacts. 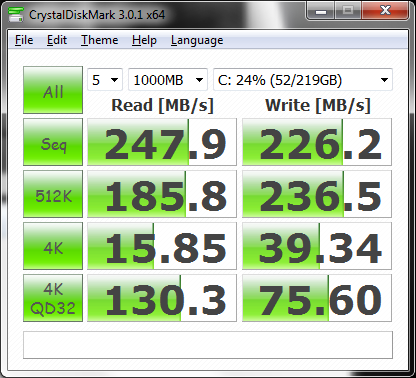 Unfortunately, the 1080p stuff only works well on the mains power (i.e. plugged in) – I suspect it needs the Turbo-Boost, perhaps – so watching 1080p content on the move might not be doable, however this isn’t critical as it’s only a 1366×768 screen. The favoured gaming benchmark seems to be Crysis these days: the unit manages 30-35 FPS on ‘medium’ setting at the native 1366×768 resolution and 20-25 FPS on ‘ high’. 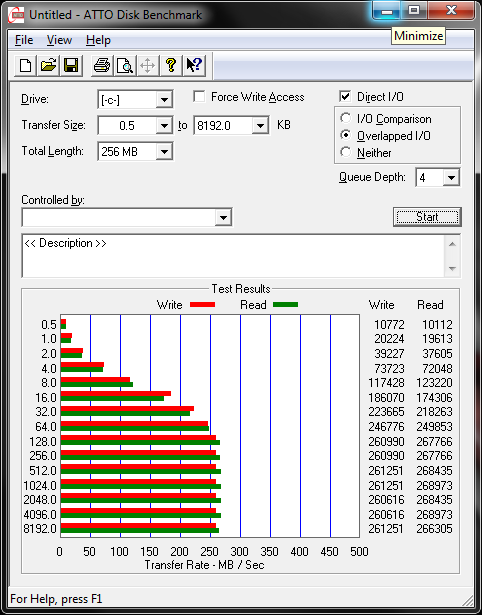 At 1920 x 1080 (on an external monitor) the unit slows down quite a bit, managing a slight stutter ca. 15 FPS on ‘high’ but a decent 20-25 on ‘medium’. 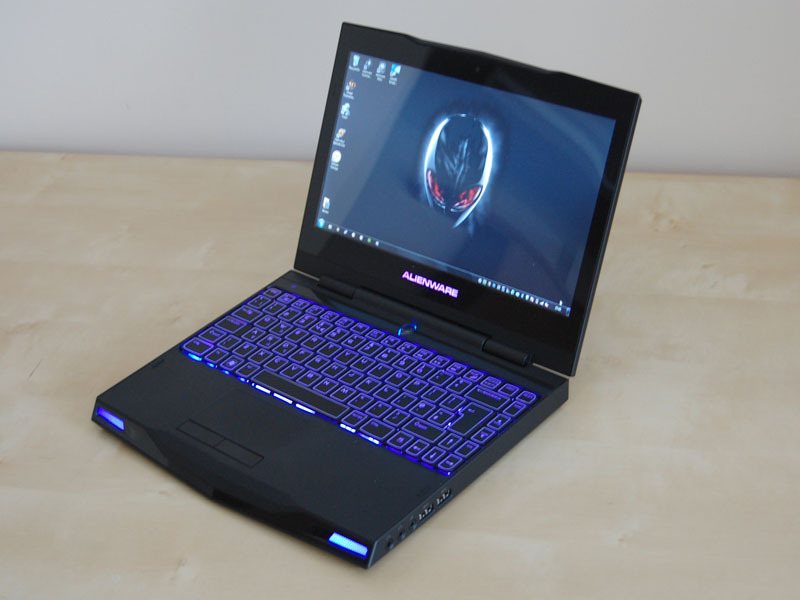 It’s easy to forget that this is actually a 1.5 GHz CPU – whether it’s the Turbo-Boost kicking in, or that the games rely far more on the graphics chip, or that this unit features an SSD, the machine feels very smooth indeed. In conclusion: I liked it. At first, I cringed a little at the styling (a less gaudy version might be a neat idea, Mr. Dell? ), but it grew on me. 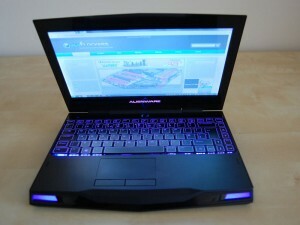 The hardware inside is fast, the laptop feels smooth and handled the tasks I threw at it without complaint. 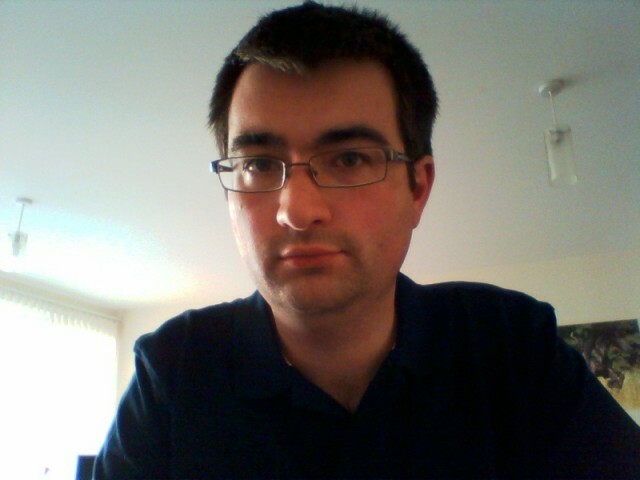 It’s let down by the screen however: I’d love to see a better quality screen, perhaps even with a matte 1600 x 900 screen although admittedly I’m a bit of a hi-res screen freak. 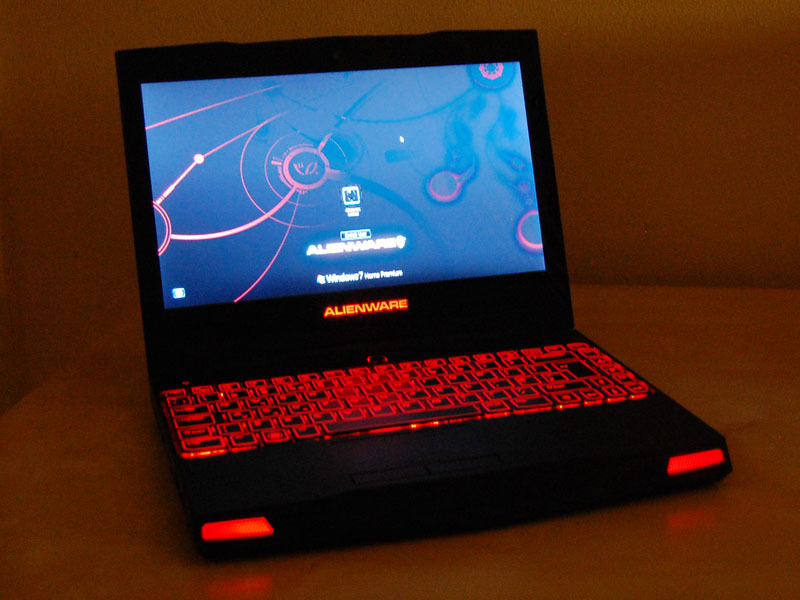 It’s a nice package that performs well at media and gaming applications, and with a few minor tweaks it makes for an excellent purchase for someone with money to spend and a desire for a gaming-orientated ultraportable. For more business-orientated people with a little more cash, I’d probably be looking at something more like the Vaio Z series or for similar cost, the 11.6″ MacBook Air. 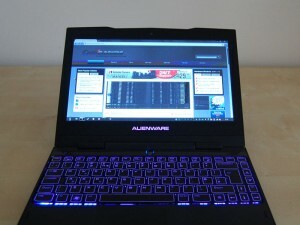 All three units have their plus and minus points, and the Alienware unit is likely to be the best, by far, for gaming. For such a complex item I can’t really bring myself to choose one of our three ratings (‘Approved’, ‘Meh’ or ‘Fail’). I’d just say if you have the cash to spend and want a gaming ultraportable, it’s definitely not going to be a waste of money. My only real complaint is some minor build quality issues. The plastic that meets the screen on the top border has developed a gap. And oil from my fingertips that transfers to the keys leaves keyprints on the screen. Other than that tho I love this thing. GbE FTW! I see your point - I'm just a bit of a hi-res screen freak :P I have 1920x1080 on my 15.4" laptop and I'd love it to be even higher (you can always increase the text size). (you can always increase the text size). That is true, but not everything scales well when you do that. Many webpages are designed to run at standard magnification and text size, and when you set it to anything but 100%/default it causes tables and margins to freak out, etc. Plus a lot of stuff is going flash and other static html design, which I'm finding won't change enough unless you exagerrate the magnification and have to constantly tinker with the setting page to page. I've toyed with this for home theater PC use in the past, to get windows use on a couch 10 feet away on a 42" LCD. Just doesn't work. Hopefully we'll all just go to goggles with the computer built in sometime soon, rendering screens moot for personal use. I've only had my m11x r3 for 4-5 months and I'm having overheating problems. One benchmark I find that most tend to leave out is the test of time. I have treated my laptop well, even using a cooling pad for the entire duration of ownership. 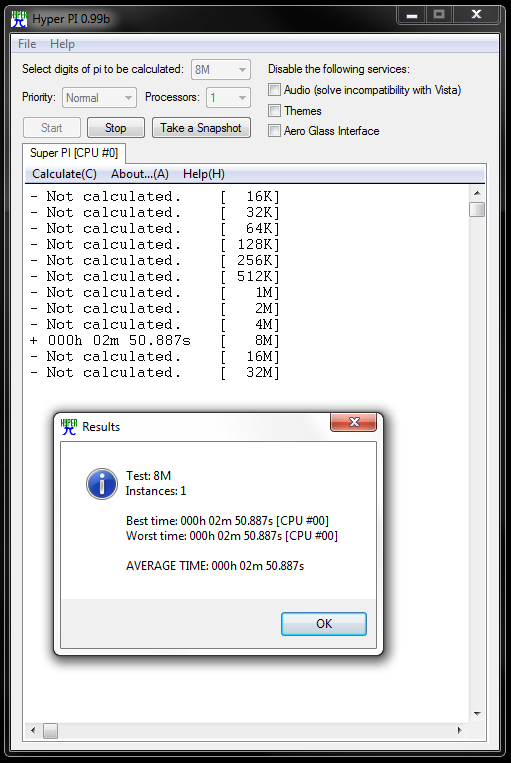 Just yesterday my CPU temps recorded heat ratings of up to 94* Celsius, (which I then turned my laptop off). and it is idling around 60-70* Celsius. Ouch! 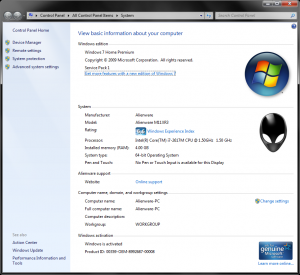 Now I have to call dell and most likely have my GPU's re-pasted.. Pretty hard to review/report on 'the test of time' unless you have a follow up review. That said, those temperatures are relatively normal, though a bit high sure, in a laptop. Seeing how this review is close to a year old did you buy the unit used? Is there dust in the heatsinks? Can you clean that out if so? Are the fans spinning properly? 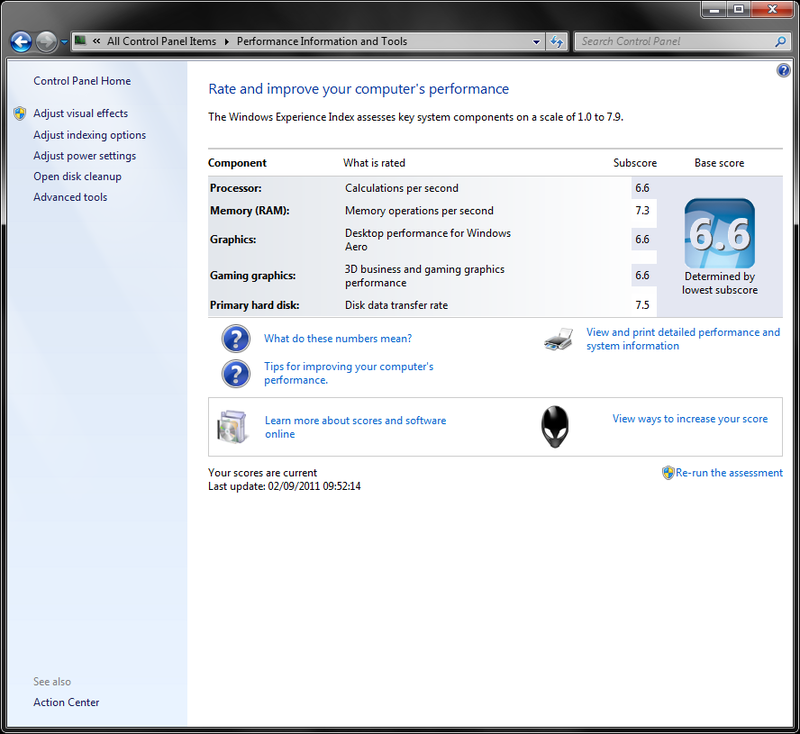 There shouldn't be any reason you need the CPU or GPU's 're-pasted' after a mere 4 months of use, that is for sure. Lots of people have seen noticeable decreases in CPU and GPU temps since repasting the heatsinks with either Artic Silver 5 or other high-end paste. I've had mine since the device's release and have been using it as a primary gaming machine. No overheating issues here. I have a new one and they must have made some changes, my fan is whisper quiet and I feel almost no heat even when under high cpu load. Or maybe I just got lucky.